A blog post by Deputy Director Tracie Guy-Decker. Read more posts from Tracie by clicking HERE. I’ve been thinking a lot lately about what happens in museums. I don’t mean what happens to the artifacts. I mean, what happens to the museum-goer. Why do people come and why do they come back? 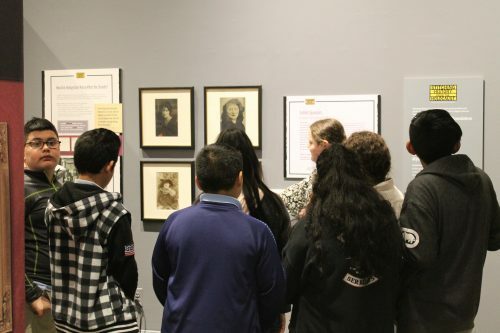 I used to think that history museums connect people to history (and art museums connect people to art, etc.). I’m starting to realize that history museums—at least when they are the most successful—connect people to people (and art museums do, too). Surprisingly enough, I came to this realization thinking about theater (and with a little help from a wise museum professional). I’ve always enjoyed live theater, and, sort of like museums, the more theater you see, the more you want to see. This season, I’ve made a point of seeing shows here in Baltimore at both Everyman Theatre and at Baltimore Center Stage. 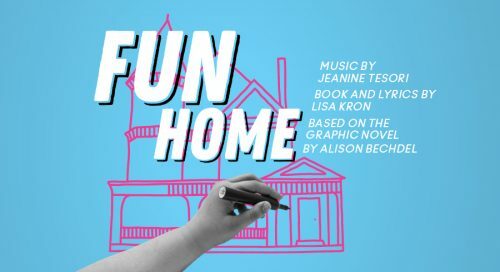 The plays with which I connect the most deeply, the ones that give me goosebumps and make me cry, are the ones that teach me something about the world or myself (or both). They do that by connecting me on a deep level with a character or characters. I don’t mean to say that I see versions of myself on stage and am moved. In fact, the specifics of the characters who move me are often wildly different than my own particularities. 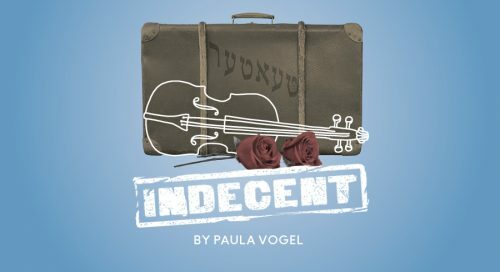 The playwright Sholem Asch, as portrayed in Baltimore Center Stage’s recent production of Indecent is hardly someone with whom I imagined I would have a lot in common, and yet sitting in that audience, I felt his pain and helplessness. I shared his dedication to words and the realization that they have so much and yet so little power. 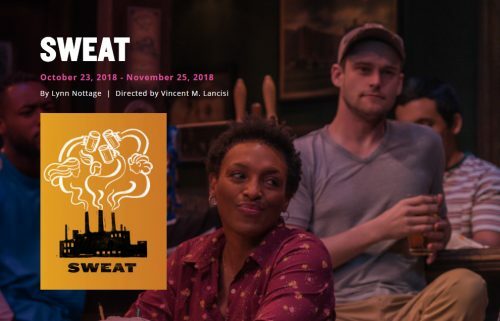 The steel workers at the center of Sweat live a life contemporaneous with mine and yet remarkably distant from me. And through the play, I felt their frustrations, their hopes and regrets. Though I’ve never faced the reality of job instability depicted in the show, I felt their vulnerability and desperation alongside them. Allison Bechdel, the protagonist of Fun Home, struggles to start a conversation with her father. She wants to talk about the fact that she has just learned that he is gay, and she is also gay. The audience knows she never succeeds. He takes his own life a short time after her unsuccessful attempts in the car ride, depicted on stage in song. I am not gay, nor was my father, but when I saw the show a few months before the sixth anniversary of his death, I cried as if I were watching my own halting attempts to connect. This is the power of good theater. It is the power of good storytelling. 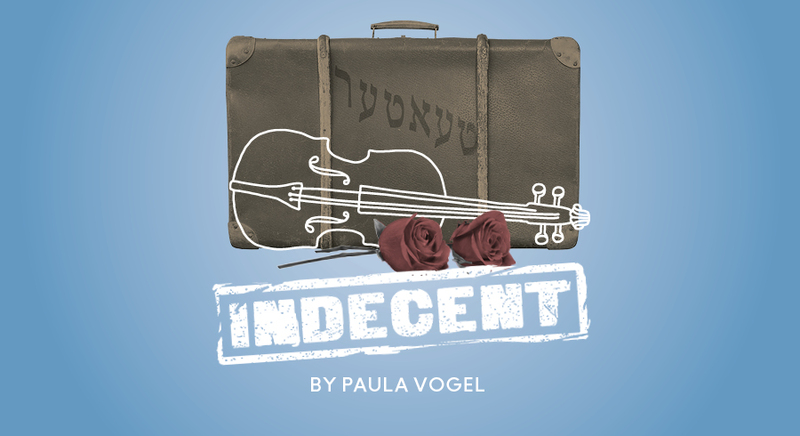 When theater or art or history evokes empathy in us, we learn about the world and ourselves. In museums the mechanism is different, but the aim is the same. Both plays and museum exhibits attempt to connect their viewers with the authentic human experiences of others. In museums empathy is evoked through an interaction with artifacts. Sometimes the artifacts themselves tell a story. For instance, the visible, uneven stitches of the many repairs and mends on the tallit gadol (prayer shawl) currently on view in Fashion Statement help the museum-goer empathize with the tallit’s owner. 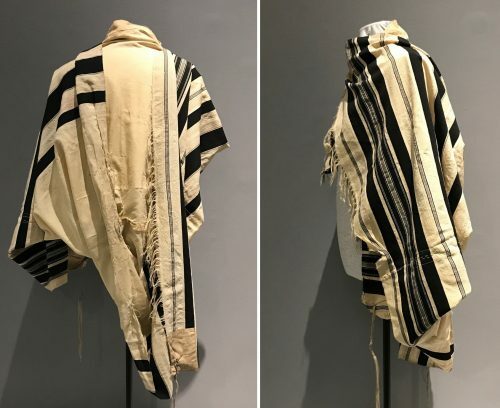 We imagine how he cared for the tallit, how he loved it. I think about some of my own possessions I love that way. For other artifacts, it is the similarity to others of the same make and vintage that allows the viewer to connect with it or its original owner. 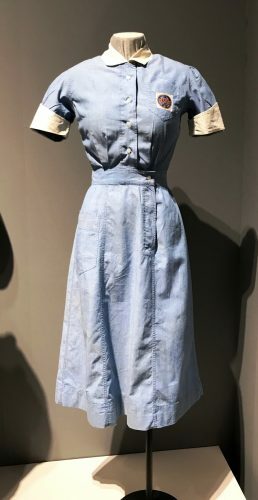 For instance, many former nurses linger with a smile over our Sinai nurse’s uniform, musing on how small their wastes were back in those days, or calling to mind specific stories or people they knew when they wore a uniform like that one. Still others offer a proximity to their owner that was never or is no longer possible. We saw that with the wild popularity of our Houdini exhibit and some of the artifacts, like the straitjacket or the diary, that were used by him directly. In our current exhibit, Gil Sandler’s hat and Shoshana Cardin’s scarves offer a similar, if smaller in scale, opportunity for visitors to be close to influential figures, at least by proxy. With every day that I am privileged to work in this field, I become more convinced that museums are magic. Through observing authentic artifacts—the belongings of others—we can connect with the people who owned them, who loved them, who saved them. Museums allow us all to be time travelers. Even better than that, as we travel through time and connect with people divorced from our specific time and place, we are offered the opportunity to learn more about the world and ourselves. I pray this journey never ends. 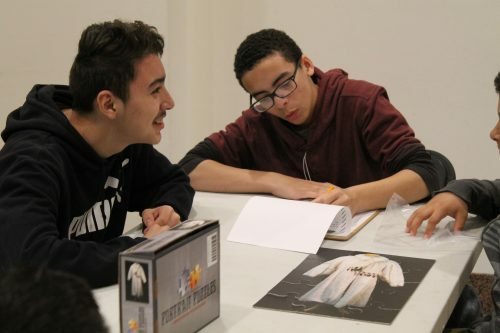 At the Jewish Museum of Maryland, we are stories tellers. We are also storyfinders, storykeepers, and storyprotectors. We are finding new stories all the time. 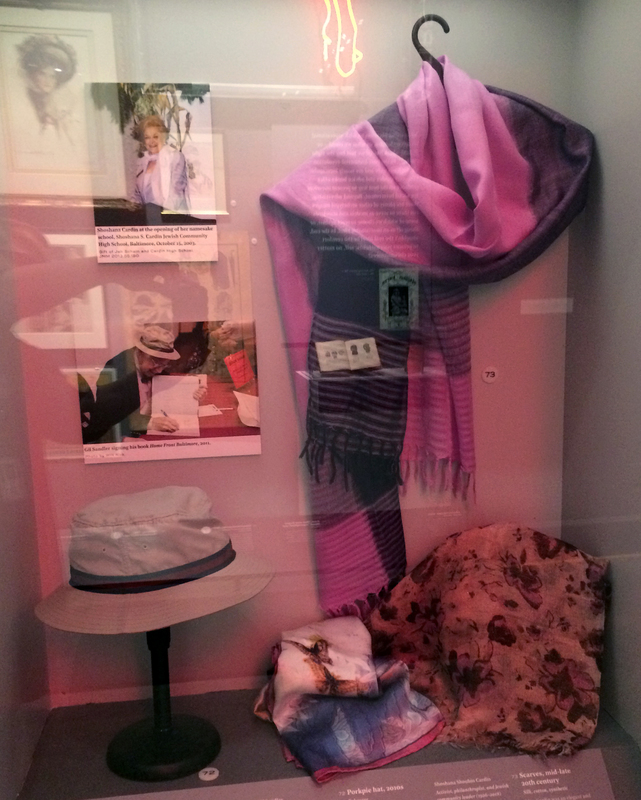 Our current special exhibit, Fashion Statement, is composed of items of clothing that tell stories about their wearers. During their recent visit, students from John Ruhrah Elementary Middle School had the opportunity to become storytellers. Thinking critically and creatively, they worked in small groups to create stories about the clothing items on display in Fashion Statement. Students from John Ruhrah’s 7th grade work together to complete their puzzle. Piecing together a puzzle is like piecing together the story of an object. As each new fact is discovered, another piece of the puzzle falls into place, eventually revealing the whole picture. 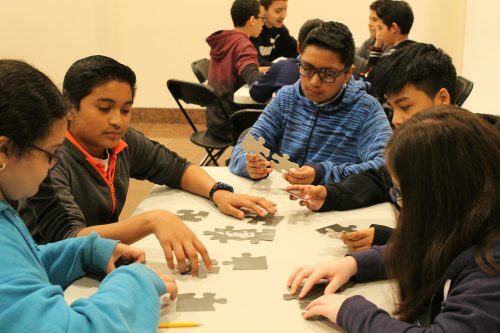 The 6th to 8th-grade students started with a puzzle. Working together as a team, they completed the puzzle to reveal an item of clothing from the exhibit. Students made observations about their item of clothing in the exhibit. 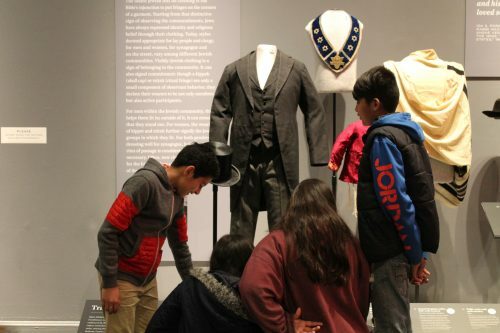 After locating their item in the exhibit, students made observations about it. Taking their cue from Nancy Patz’ book “Who Was the Woman Who Wore the Hat?” students asked questions that a researcher would ask when trying to learn more about an object in a Museum. What is the clothing item? What material, or materials, is it made of? Who wore it? Why do you think someone would wear this specific item? Why was it chosen to be on display by the Museum? Students used their observations and questions about their object to write stories. Then, mimicking the rhythmic lyrics of Nancy Patz’ book, students worked together to complete fill-in-the-blank stories for their items. Who was the person who wore the (blank) coat? What was she like? Was she (Blank)? Taking an active role as the storyteller, students were empowered to think about what clothing represents. In the case of Stitching History from the Holocaust (see Part 1), clothing was a means for survival and representative of a talent lost to the world. In Fashion Statement, clothing is a way to express your identity. At the end of the visit, students considered: What can we learn about people through their clothing? What can’t we learn about people from their clothing? What does clothing mean to you? I encourage you to think about these questions as you visit Fashion Statement and explore how Jewish Marylanders, and all human beings, use clothing as one of the ways we assert who we are. 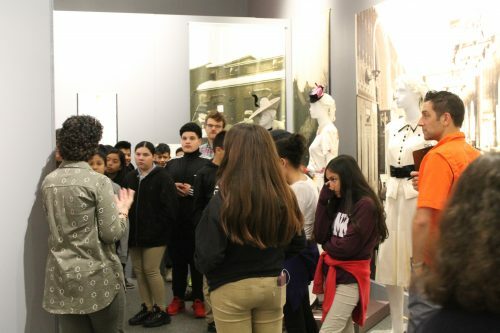 Thank you to the 6th to 8th-graders at John Ruhrah Elementary Middle School for visiting the Jewish Museum of Maryland this spring. 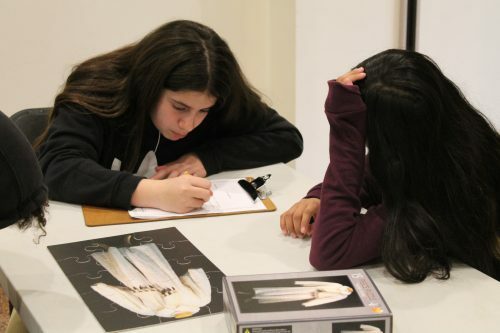 If you are interested in bringing your school, summer camp, or group, please contact Paige Woodhouse, School Program Coordinator, at pwoodhouse@jewishmuseummd.org or 443-873-5167. Not all stories fit on a label in an exhibit. Looking to learn more about some of the items on display? Check out some “extras” here.